My Blissful Journey: Midweek Munchies is BACK...and a Home-Made Tomato Soup! Midweek Munchies is BACK...and a Home-Made Tomato Soup! Another quick post today! First up another soup I have made and enjoyed! Sprinkle of Nutmeg, Smoked Paprika, Basil or Oregano, and Pink or Black Himalayan Sea Salt. It was YUMMY! You can do this RAW or COOKED Vegan! Check it out! LINK UP Below!!!! If you haven't ever participated in MWM (MidWeek Munchies) - all you have to do is link up with a post for a vegan recipe, product, review, shopping haul, garden pick, Farmer Market finds, etc...anything plant-based and/or vegan is welcome! This looks great, love the amount of garlic. Thanks! This is such a delightful recipe. 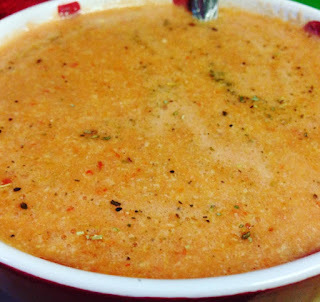 I grew up eating Campbell's Tomato Soup served by my Mom but this is so much healthier! Thank you for sharing your healthy and delectable Tangy Vegan Tomato Soup recipe with us on the Plant-Based Potluck Party Link Up. I'm pinning and sharing. Thanks! I have been trying to do more and more Tomato Soups at home! I hope to post more recipes and ideas soon!